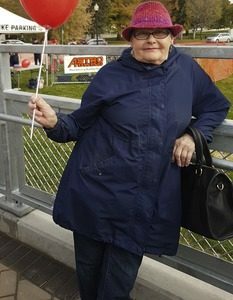 The family of Ellen Annette Lipinski is sad to announce the death of our dear mother, grandmother, great grandmother, sister, and auntie, on January 29, 2019, after a year-long battle with cancer. She was predeceased by her husband Peter, son Darren, sister Valerie, her parents Henry and Anne Combres, her sister Linda Tanchak, and her cherished mother-in-law Katie Lipinski. She is survived by her children: Sandra Lazar (Terry), Barbara Maruschak, Cameron Lipinski (April), Laura Lindsay (Darrell); and her grandchildren Clayton Lazar, Tyler Lazar, Natasha Maruschak, Raina Lipinski (Thomas), Kayla Lipinski, Darren Lipinski, Karen Lindsay, Peter Lindsay, great grand daughter Alice Guenther; sister Darlene Hahn (Richard), brother-in-law Ken Tanchak, brothers; Arnold Combres (Marjorie), Bunny Combres (Yvonne), Clifford Combres (Maureen), Wayne Combres (Norma); numerous nieces and nephews, many other family members and cherished friends. Mom always talked about her many friends made throughout her life and in her work years. She was an avid gardener – a true green thumb, and loved working out in her yard. She loved her bus and car road trips on her own or with her friends travelling to many different casinos on bus trips as well as her other great adventures which took her to England and France, many states in the US, Mexico, her beloved Hawaii, and Alaska. Mom’s last year was met with health challenges along with many happy memories and experiences with her family and friends. She was a fiery, independent, fun, and sweet spirit throughout her life and was treasured by all who knew her. Lots of lifelong memories were made, and mom will be missed and loved forever. In lieu of flowers mom requested that donations be made to: Richard Cemetery Fund: c/o Frances Anderson – 11230 Gardiner Dr. North Battleford SK, S9A 3M6, ph: 306-445-6424, and/or; Alzheimer Society of Sask Inc., 1407 Falkner Cres., Saskatoon SK, S7L 3R5, ph: 306-683-6322. A celebration of mom’s life will be announced and held in Spring 2019, as she wanted all to gather and think of her at a time of newness and greenery of the spring season (her words). Private interment will be held at a future date at the Richard Cemetery.